The CMS men’s open racing team placed third out of twenty two teams in the New England Half Marathon Championship in New Bedford. 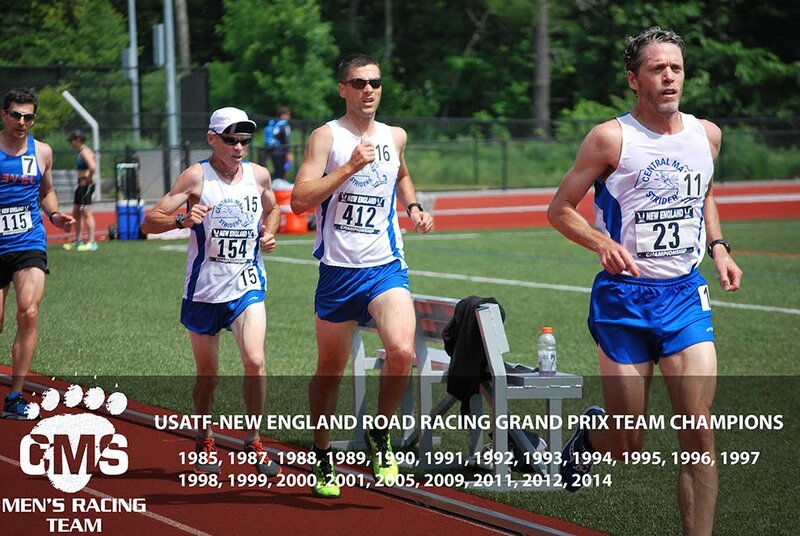 This was race number two in the USATF New England Road Race Grand Prix. Nate Jenkins placed second overall. 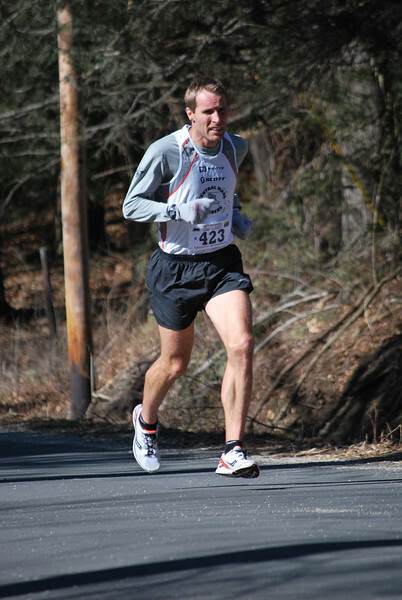 Dan Vassallo was the second CMS runner to cross the line, 28th overall. Scott Leslie, just removed from a 50K in the previous weekend, was 35th with team manager, Al Bernier following one place behind him. Three places later in 39th, Greg Hammett finished the scoring for CMS. 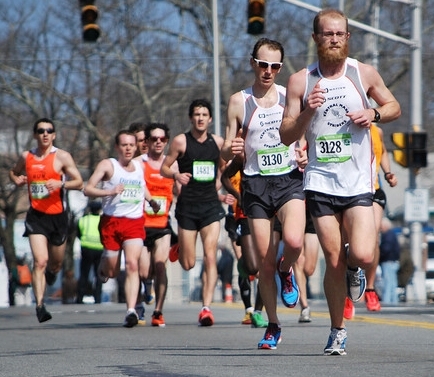 Scott Leslie (front) and Al Bernier at mile 5 at the New Bedford Half Marathon. Scott and Al would finish 35th and 36th overall to score as the 4th and 5th men for the CMS Men's Open Racing Team. 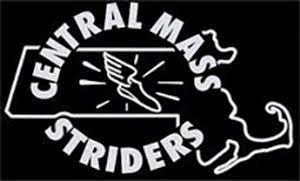 The CMS men’s masters team placed second overall out of 17 teams from all over New England. CMS masters scoring was led by George Adams who ran a 50K the previous weekend with Scott Leslie. George was followed by Joe Shairs and Jason Porter who both got under 1:16. Dan Verrington and Dave Dunham rounded out the scoring for the masters team who finished behind BAA. CMS has been all over New England and New York over the past month as the results show below. 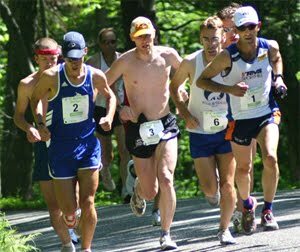 More recently, CMS wins the USATF 50K Road Championships again in Long Island New York. They were led by Scott Leslie from Rutland, MA. He placed fourth overall. George Adams finished 6th overall and first master overall. Ben Nephew and Daniel Verrington (2nd master) followed right behind George. Nate Jenkins led the way for the CMS Open team as they placed 3rd overall in the USATF New England 10 mile road championship in Amherst, MA. Greg Hammett, Kevin Tilton, Dan Vassallo, and Scott McGrath completed the scoring (top five for the team score) while all placing in the top 30 overall. There were several outstanding performances while CMS showed depth in case throughout all age groups. The CMS Masters team made a statement today to all other teams in New England, winning by over fifteen minutes on a clear cold windy day. Tivo led the charge while placing as the fourth overall master. George, Greg, and Dave followed, placing 6,7,8 within 30 seconds behind Tim. Joe Shairs closed out the scoring, 11th master overall, a half minute behind Dave. Ernie Brake placed 5th overall in the 50+ age group. The event of the day was the men’s 5000 meters. The race was so big, officials made the decision to make two heats. The first heat brought the CMS debut of Adam Malek who ran a very exciting and tactful race. He trailed two competitors heading into the bell lap. Adam unleashed a piercing kick to win by a convincing two second margin, 14:59.64 – a significant personal best time. Heat two included Greg Hammett, Greg Putnam (42), Chris Mahoney, and George Adams (41). Greg placed 2nd in his heat, running 15:36.77. Greg Putnam followed in 15:39.67 (1st 40+ in New England). Chris Mahoney, racing for the first time since last summer, made sure he broke sixteen minutes, with a time of 15:58.92. George Adams, running his first indoor track championship in several years, showed the young college lads how it’s done, running 16:14.01.